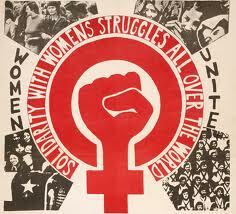 Tuesday, March 8 is International Women's Day! A day to celebrate all of the women in your life, and women that you don't know, that make our world a better place. Through our work in fields, advocacy and tireless commitment to community and future generations, this day unites women from all over the globe to recognize their contributions to peace, development and sustainability. The day started in 1975 when the United Nations proclaimed March 8th as International Women's Day to celebrate women's global activism and peacekeeping activities. In the United States, women were first celebrated on the National Women's Day on February 28, 1909 after a women's garment workers strike. I don't know if women in oppressed countries know about this day, but on Tuesday, I'm going to be in solidarity with women everywhere who fight for justice, a clean environment, healthy food, and peace. I will be in the company too, with other women advocacy organizations such as Oxfam America. Below is some info about the event I will be at, but if you're not in the East Bay, look up an event near you or consider having women you care about over for dinner to dialog. Women, the world over, are making the change that politicians only promise. Reception, Presentation and Panel Discussion...all FREE! 6:30 to 7:10 pm: Informational networking reception in the gallery where guests can enjoy sustainable appetizers, organic wine and fair trade tea and coffee, while mingling with local luminaries and browsing informational tables featuring local non-profits. 7:10 to 8:30 pm: The evening will continue in the Goldman Theater with short films and a presentation from special guest Ms. Prak Souern, a rice farmer and community leader from Cambodia, followed by a panel discussion and Q&A with some of the Bay Area's pioneers for ethical change, food experts, and leaders in business and government. This event is the beginning of a dialogue about food justice in its global dimensions. We don't expect to arrive at all the answers in one night, but it's urgent that we further the conversation. There is something drastically wrong when nearly 1 billion people in the world are chronically hungry. And most of them - 3 out of 5 - are involved in food production, either by farming, fishing or herding. Women are the majority of farmers in this context, and so shoulder the added burden of gender inequality. There is something wrong when our US cities have pockets of so-called 'food deserts' where people of limited income cannot easily access affordable healthy food. And there is something wrong when the food we do eat today depletes our natural resources for tomorrow because of unsustainable practices. But it does not need to be this way. We can embrace solutions and a smarter, fairer food economy. So join us, at what promises to be a fun, uplifting and enlightening event, and find out how we can choose better ways to eat and grow our food, and at the same time advocate so that people worldwide have the rights and the resources to do the same.